August 1940. Coaldale, Pennsylvania. 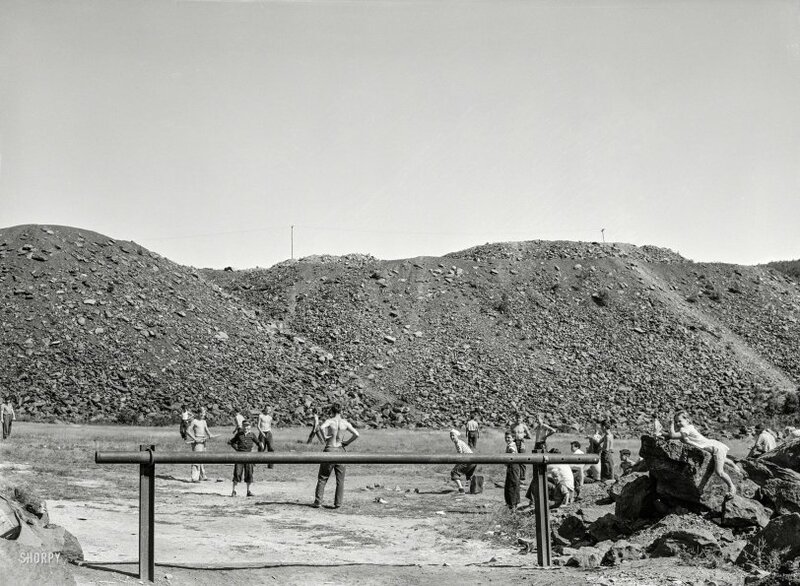 "Baseball diamond for children with slagpile in background." Photo by Jack Delano, Office of War Information. View full size. Submitted by EvenSteven on Sun, 02/18/2018 - 8:29pm. ... at least if you were a kid like me 10 years after the above game and before Little League BB ruined a good afternoon for all kids. We had an empty clay field with no houses or roads within a hard hit ball reach. Two team captains were picked and the bat was tossed to one of them and then the other captain put his hand just above where the first captain grabbed the bat. The captains kept alternating hand positions until the nub was reached and one of the captains could not get his hand around and thus that captain chose second. Rules were very fluid such as any ball hit on the fly to right field or third base was an out depending on the number of players and four fouls you were out. If no one volunteered to be ump players were put on the honor system and made the ball, strike and out calls. That worked most of the time but we had all seen pictures and newsreels of Casey Stengel and Leo Durocher arguing the finer parts of the game so we all had to do our impression of MLB managers now and then. The best part was there were no adults. We worked all details out, had a good time and did not worry if we didn't get a hit for tomorrow was another day and we surely would get the game winning hit then. Little League has its good points I imagine but not the fun without any pressure we had. Everybody played since getting 18 players was tough and so what if you muffed a play or struck out four times it was a grand time. Submitted by perpster on Sat, 02/10/2018 - 4:51pm. Lean, because the times were mean. And because couch potatoes hadn't been invented yet. Submitted by StefanJ on Sat, 02/10/2018 - 1:36am. Imagine that that was a pile of marble tailings, and the batter hits an outfield (is that the terminology)? Go find the ball yourself, then. Might be hard enough with a white ball in a grayish blackish slag pile. If the ball is still kind of white in the first place. Another frequent observation, very little body fat in evidence. Submitted by Richietwo on Fri, 02/09/2018 - 10:01pm. As LaviathanRider noted, no one has a glove. I hope sure hope someone's got a ball. Submitted by ausonius on Fri, 02/09/2018 - 4:33pm. These piles were a prominent fixture around most “coal patches”, and went by various names; in Southwestern Pennsylvania they were called slate dumps. One could also find good coal among the slate and my childhood “patch” had at least one family of “coal pickers” who made a living picking up coal chunks both on the dump and along the railroad spur that serviced our local mine. Submitted by LaviathanRider on Fri, 02/09/2018 - 9:43am. No one has a baseball glove. Submitted by racco on Fri, 02/09/2018 - 5:28am. Growing up, I had relatives in another northeast Pennsylvania town. One had a similar slag pile not far from her home. The shale pieces were a good place to find plant fossils.